"West Islip" redirects here. For the USSB ship, see SS West Islip. West Islip is located at 40°42′54″N 73°17′52″W﻿ / ﻿40.71500°N 73.29778°W﻿ / 40.71500; -73.29778 (40.715008, -73.297746). According to the United States Census Bureau, the CDP has a total area of 6.8 square miles (17.5 km2), of which 6.3 square miles (16.4 km2) is land and 0.42 square miles (1.1 km2), or 6.46%, is water. Great South Bay, Jones Beach Island and Fire Island lie to the south. Babylon and North Babylon form the western border. Bay Shore lies to the east, and in the north West Islip borders on Deer Park and Brentwood. 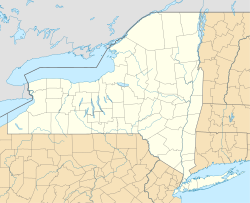 West Islip is 45 miles (72 km) east of Manhattan and 45 miles (72 km) west of Southampton, New York. West Islip's western boundary is a natural one formed by Sampawams Creek, Hawley's Lake, Deer Lake and Swan Creek. As of the census of 2010, there were 28,335 people in 9,040 households in the CDP. The racial makeup of the CDP was 95.9% White, 1.7% Asian, 0.6% Black, 0.1% Native American, and 0.6% from other races, and 1.1% being multiracial. There were 7,459 families, out of which 39.4% had children under the age of 18 living with them, 68.2% were married couples living together, 10.3% had a female householder with no husband present, and 17.5% were non-families. Nearly 11.4% of all households were made up of individuals, and 6.9% had someone living alone who was 65 years of age or older. The average household size was 3.09, and the average family size was 3.43. In the CDP, the population was spread out, with 25.6% under the age of 18, 4.0% from 18 to 24, 31.8% from 25 to 44, 21.9% from 45 to 64, and 12.2% who were 65 years of age or older. The median age was 37 years. The median income for a household in the CDP was $103,789, and the median income for a family was $117,451. Males had a median income of $75,868 versus $54,389 for females. The per capita income for the CDP was $38,933. About 2.9% of families and 3.4% of the population were below the poverty line, including 4.9% of those under age 18 and 4.3% of those age 65 or over. Children living in West Islip attend grades K-5 in one of the district's four elementary schools, and grades 6–8 in one of two middle schools. Elementary and middle schools in West Islip are assigned by demographics. Children in families living on the south side of the LIRR Babylon/Montauk branch tracks are assigned to either Bayview Elementary, or Paul J. Bellew Elementary. Children who live on the north side of the tracks attend either Manetuck Elementary, or Oquenock Elementary School. In 2012 the school district closed two elementary schools; Kirdahy (Captree) Elementary School and Westbrook Elementary School. North side junior high school students attend Udall Road Middle School, and those on the south side attend Beach Street Middle school. For high school all middle schoolers move up to West Islip High School (located at 1 Lions Path, off of Higbie Lane) for 9th grade through 12th grade graduation. Flash-based internet cartoon series Homestar Runner references West Islip in the cartoon "old comics". An apparent West Islip resident e-mails Strong Bad, which results in the character mispronouncing the name of the town as "is-lip" rather than the common pronunciation "ice-lip". Strong Bad also parodies the name, imagining West Islip as a "British new wave band". A poster for the fictional band later appears in the character's video game, Strong Bad's Cool Game for Attractive People. American Abstract Expressionist artist Robert Motherwell made many prints at ULAE located in West Islip. He named one print "West Islip" in tribute to the locale and the print shop where the edition was pulled. Tom Bohrer, two time Olympic silver medalist in the coxless four (1988 and 1992) and head coach of the Boston University Men's Crew. Al Oerter, Olympic discus thrower. Prior to Mexico City Olympics in 1968 he lived in West Islip and would frequently work out at the high school field. ^ a b "Geographic Identifiers: 2010 Demographic Profile Data (G001): West Islip CDP, New York". U.S. Census Bureau, American Factfinder. Retrieved 2013-01-10. ^ a b c "American FactFinder". Factfinder.census.gov. Retrieved 2014-05-07.